Deeply caramelized sugar provides roasted notes that blend nicely with a rich malt base and pairs with a mild, underlying hop character for a long, dry finish. 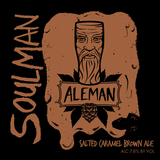 Coming into this world shot from a cannon full of Superbad, SoulMan was born from the lavish half of an experimental partigyle brew. In the same way that the words aren’t nearly as important as how you sing them, hand-made salted caramel adds the boogie and the sexual healing to our take on the classic Brown Ale.